Use Disk Utility to create a DMG of the installer DVD. Add the DMG to Jamf Admin. 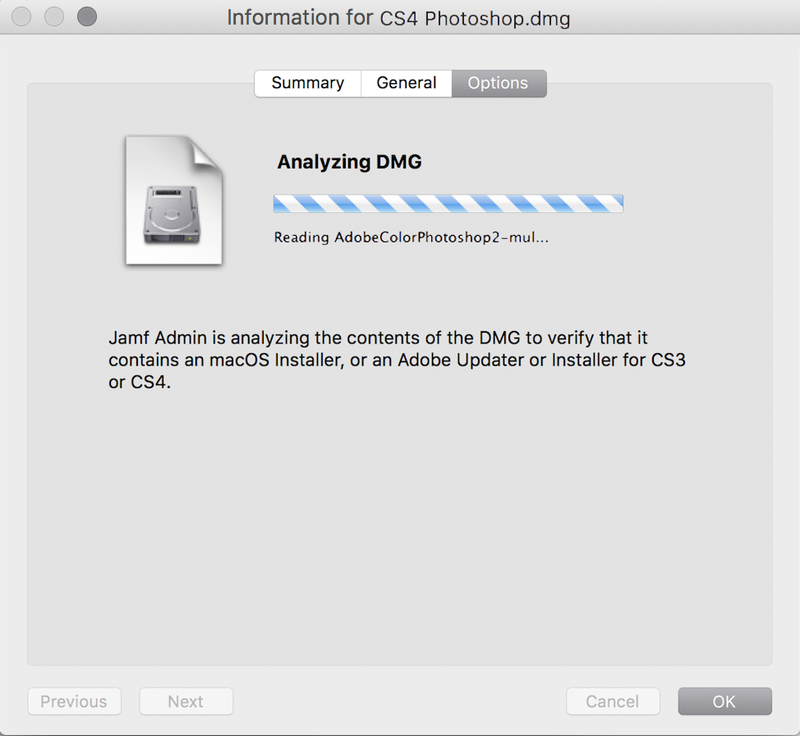 For more information, see Adding a DMG of an Adobe CS3/CS4 Updater or Installer to Jamf Admin. Create an Adobe installation from the DMG. 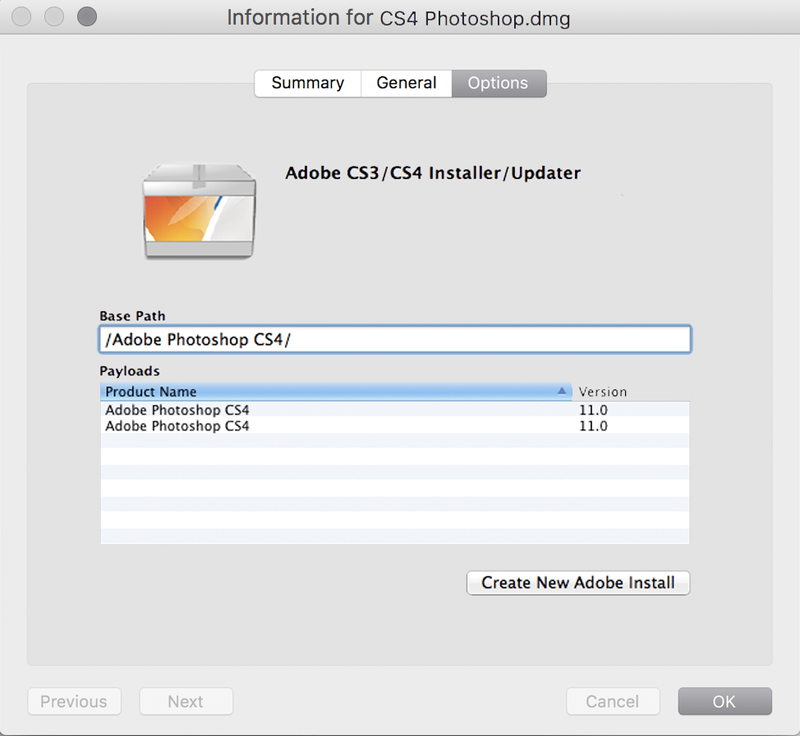 For more information, see Creating a CS3/CS4 Adobe Installation. Install the Adobe installation using a policy or Jamf Remote. For more information, see Installing Packages. Obtain or create a DMG of the appropriate Adobe Updater. The Adobe Updater must support silent installation. Note: Most Adobe updates are available in the DMG format at Adobe’s website. Install the DMG using a policy or Jamf Remote. Adding a package to Jamf Admin adds the package to the master distribution point and Jamf Pro. Drag the DMG to the main repository in Jamf Admin. The DMG is displayed in blue text in the Unknown category until you add it to a category. Double-click the DMG in the main repository. Click the General tab and configure basic settings for the DMG, including the display name and category. 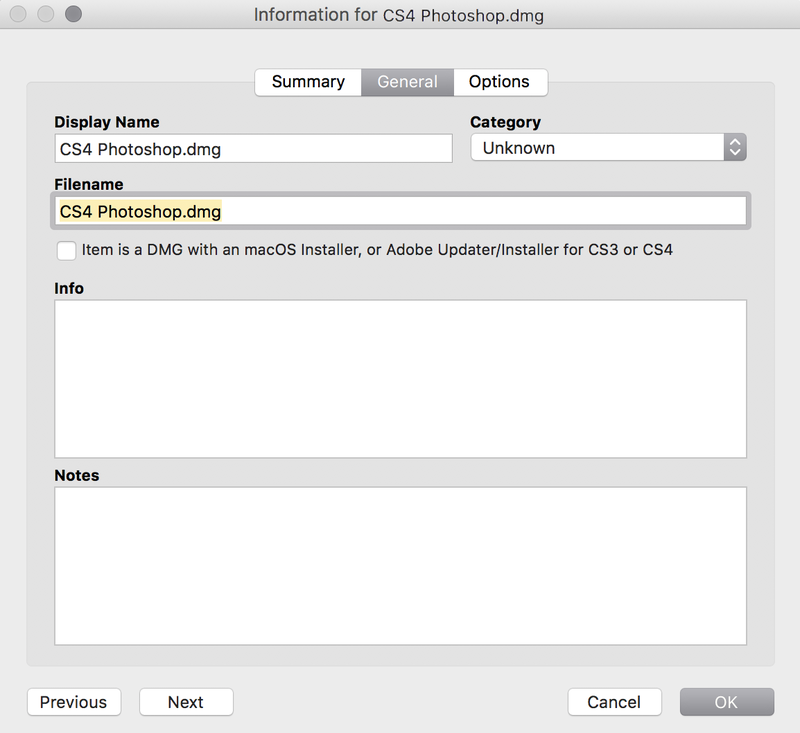 Be sure to select the Item is a DMG with an macOS Installer, or Adobe Updater/Installer for CS3 or CS4 checkbox. When prompted, click OK to continue. Jamf Admin analyzes the contents of the DMG. When the Options pane appears, click OK. 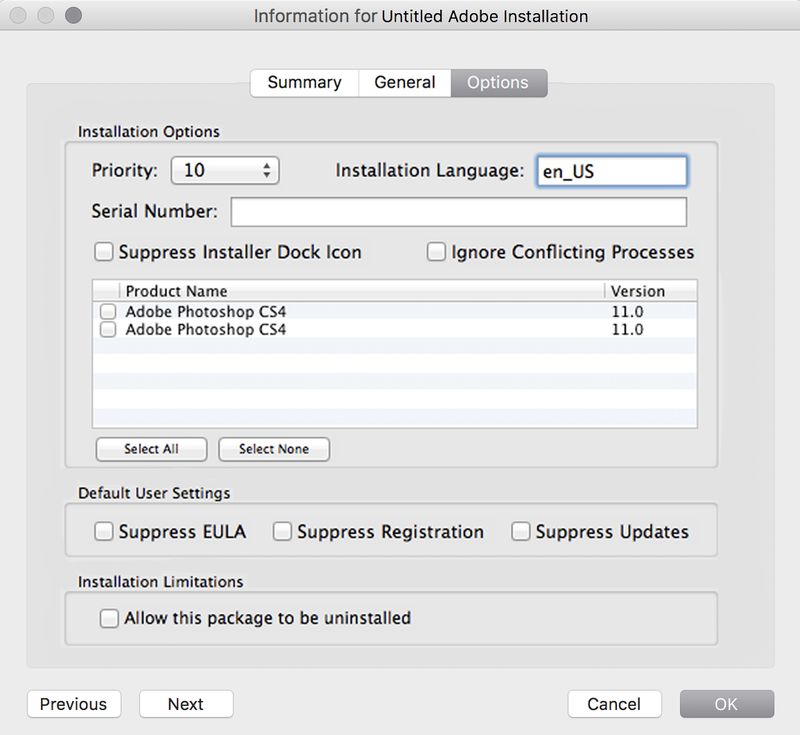 Choose a priority for the deploying or uninstalling CS3/CS4 during imaging. Enter a serial number for the installation. Suppress the Dock item during installation. Suppress the EULA, registration, and updates. Click New Adobe Install . If you have more than one DMG of Adobe Installers, choose the one on which you want to base your installation from the Installer/Updater pop-up menu. On the General pane, configure basic settings for the installation, including the display name and category. Click the Options tab and configure additional settings for the installation, including the priority and installation language.